Info "Ninjas are cool, except when they try to steal your ice cream! Hurl a star to show him what's up!" 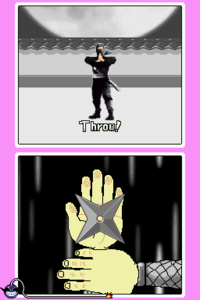 Star Struck is a microgame found in the Cute Cuts stage in WarioWare: Touched! The objective of the game is to use the to throw the shuriken at the ninja to make him fly against the wall. 1st level difficulty: The ninja stands still. 2nd level difficulty: The ninja teleports between three different spots. 3rd level difficulty: The ninja teleports between five different spots. This page was last edited on March 5, 2019, at 02:08.